Further to my articles on the value of email newsletters and common email newsletter mistakes, Javier Marti from Trendirama.com wrote a comment requesting an example of an effective newsletter design. Whilst I cannot preach the gospel when it comes to good newsletter design, I can use examples of the newsletters I send to newsletter subscribers at Just Chat and highlight some key design tips. Your reader probably subscribes to many other newsletters besides yours so make it clear from the outset who is sending this one. Include your site’s branding – use your logo, use your site colours, use familiar graphical elements and write in the style your users would associate with your site. Ensure that your reader will know immediately who your newsletter is from before they even start reading. You are sending your subscribers a newsletter – not a full blown webpage! By all means use HTML (always offer a text only alternative), but keep design elements simple. Ensure you break up chunks of text with titles and sub headings, and include small graphical elements to keep the newsletter easy on the eye. The easier your newsletter looks to read, the more likely it will be! When talking about specific features or areas of your site, include links for the reader to click! Remember, web users are lazy – if you don’t provide a link for them it is unlikely they will take a look at what you are telling them about! Your subscribers want to know about you and your site – they didn’t subscribe to your newsletter to be bombarded with nothing more than ads. It’s OK to include one or two subtle ads but ensure they are not distracting, and are not the basis of your newsletter’s content. Once you have decided on a general newsletter design, stick with it. Your readers will get used to your newsletter’s template – it will become familiar to them and ensure they are sure the newsletter is from your site. By all means, tweak the newsletter and address any problem areas but try to stick with the same overall design. Store it as a template and use it for future mailings. 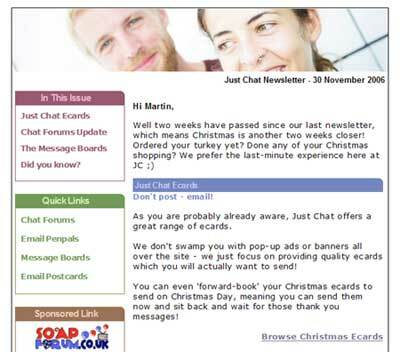 All Just Chat newsletters are sent via Constant Contact who provide a number of templates which can be used and customised. I have used our November newsletter as an example to accompany this article. This article has only described what I consider to be the top five most important newsletter design tips. I have deliberately not covered the content aspect of email newsletters – I will write an article on this in the future. Do you agree with the tips I have included in this article? What aspects of newsletter design do you think I have missed? Please leave any comments you have below. These tips are excellent. I’d like to add that one gripe I have with newsletters is the inconsistency in managing delivery preferences. For instance, I’d like to manage what types of newsletters I receive and adjust delivery preferences to allow a monthly e-mail, as opposed to a weekly. I also love creating my own types of “newsletters” of sorts by using RSS aggregation services like Bloglines or Rojo to deliver them to my inbox. Those types of e-mail offer more value for my needs. Other than that, I enjoyed your entry. Very nice blog, too. Hey Joseph – welcome to the blog, and thanks for your comment. I think you raise a good point about delivery options – before people sign up for a newsletter they should be given some idea of how often they will be receiving them, and perhaps be given the choice of how frequently they want to receive mailings. Although this article was focussed solely on newsletter design you do raise a valid concern. I am actually starting a newsletter soon and appreciate your post. Any tip I can get I will use. Yours make good sense and are totally applicable to what I want to do. Hi Dave – thanks for your comment. I am glad the post was useful and informative for you. I hope to write a few more articles about newsletters in the future, so hope you stick around and continue to contribute to the blog. With this i really confused in how to design newsletter. Nareem – Newsletter design is about mastering the basics; was there anything in particular that confused you? Also there needs to be some thing good and informative for the subscribers. It should also leave a hint of what is up for grabs in the nest newsletter. And for ads, I thinks we shall follow the Adsense approach. Just try to blend the ads in the content to camoflouge it. Sorry if the spelling is wrong. It shall also include a unsubscribing option. It helps. Thanks a lot for the wonderful tips. Teenage – That’s a good idea; creating suspense can keep people interested in your content and prevent them from unsubscribing. Thanks for your comment! Could I ask you about how you make your newsletter? Is the newsletter a function of your Community or CMS software (with automatically populated content, such as latest posts, etc) or do you manually make up the email template and enter the content each time it’s published? I like the tips here a bunch, but are there any other email companies that you’d suggest looking at in addition to Constant Contact? I’d like to at least review a few before deciding on one.